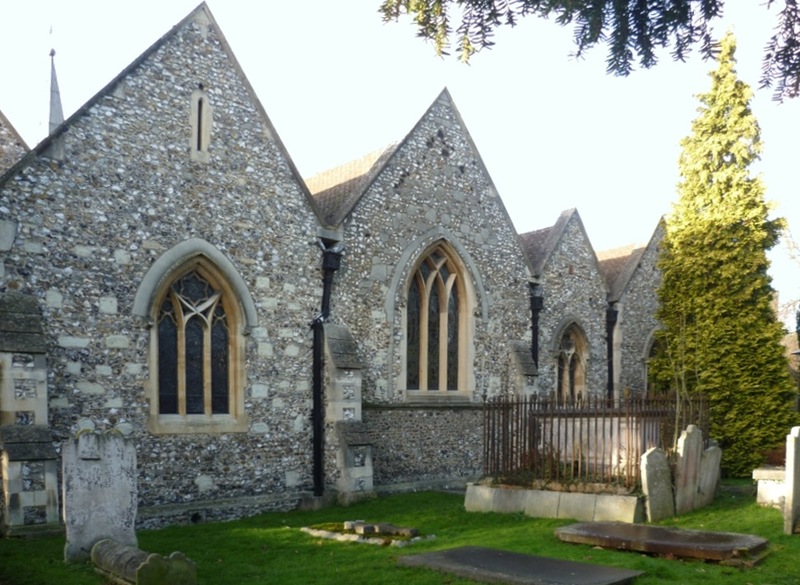 St Nicholas Church is a Grade I listed building off Summer Road, Thames Ditton in Surrey. 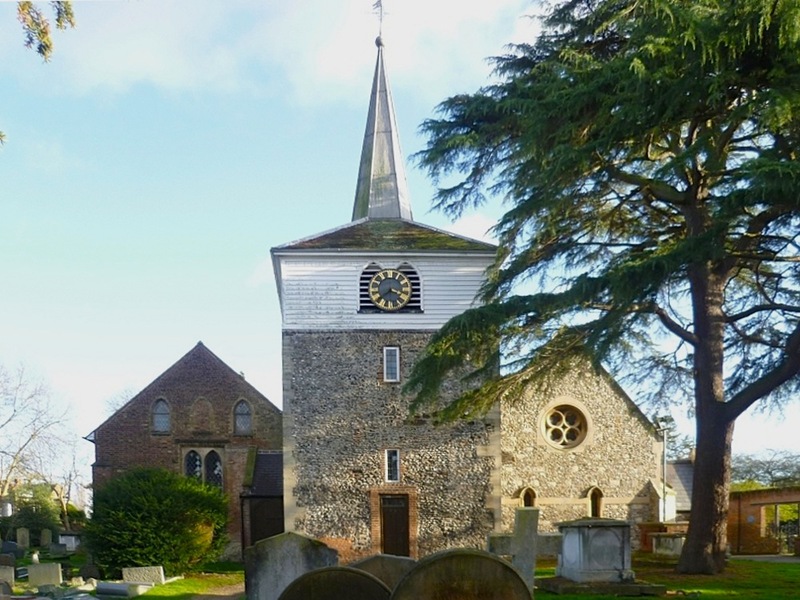 Attractively built of flint with stone dressings, it has a part-weatherboarded tower with a clock in front of the belfry openings, clay tile roofing and a smart lead spire (see "Thames Ditton Conservation Area"). The chancel and tower date from the 13th century, the north chapel is perhaps 16th century and the outer brick wall to the north is early nineteenth century by William McIntosh Brooks (see Nairn and Pevsner 481; "Parishes: Thames Ditton"), but by far the most significant additions have been those of the south arcade, aisle and chapel by Benjamin Ferrey in 1864. These considerably enlarged the church and lightened its atmosphere. View of the east end, showing Ferrey's addition on the left. Left to right: (a) Window on south wall. (b) South porch. 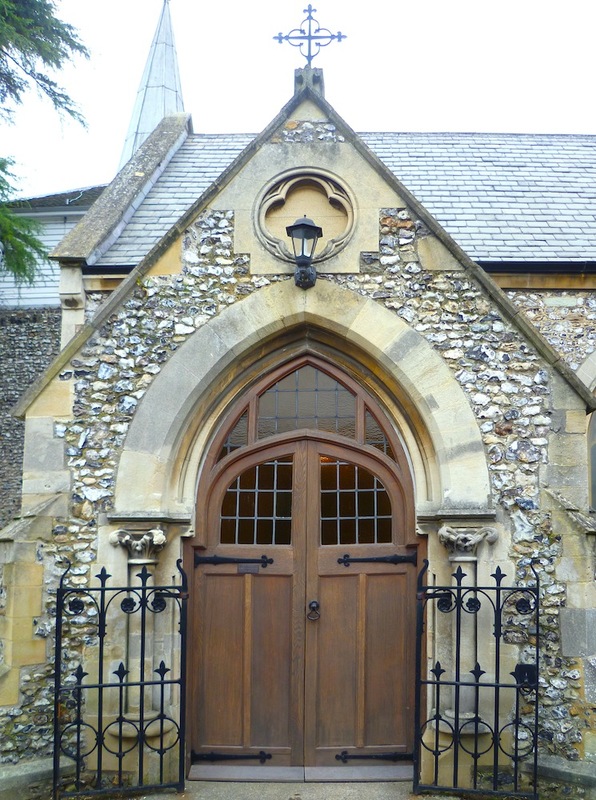 (c) South porch entrance. The widening of the original narrow building has yielded a picturesque series of gables at the east: "The E view of the church, with four gables, is handsome" (Nairn and Pevsner 481). The south wall windows were of course Ferrey's, and the details of most of the others too have been been restored: as the listing text puts it: "Most windows C19 restorations." Ferrey's south porch is pleasant, with its variegated tones, especially the yellow and grey of the arch around the double doorway, and the other stone dressings. 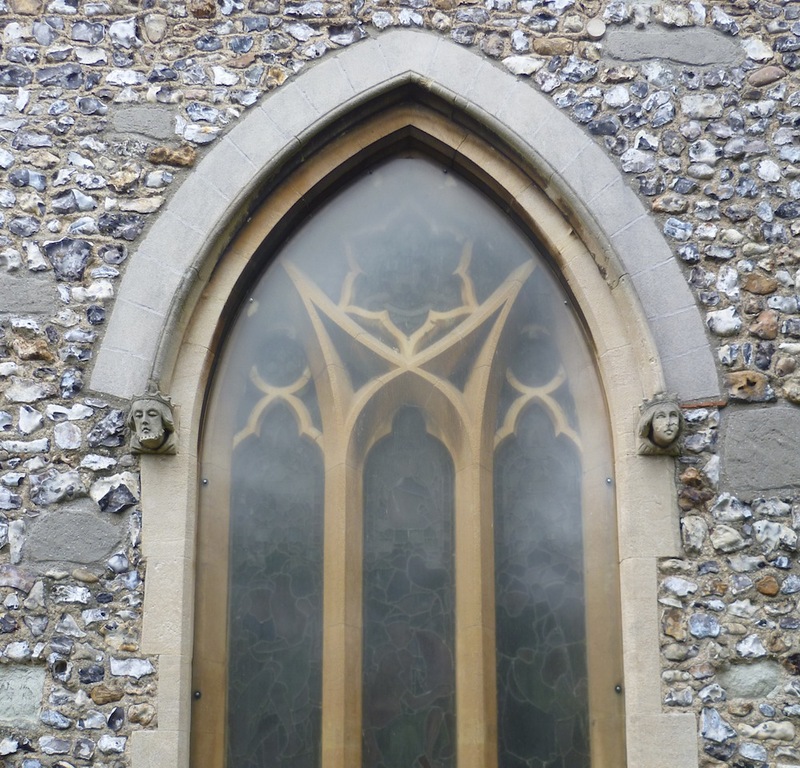 There is a quatrefoil design at the apex and a finial echoing both that and the pattern of the iron gates. Everything is in harmony. Across the path here is a pretty walled Garden of Remembrance, with rose-beds and benches for quiet reflection. 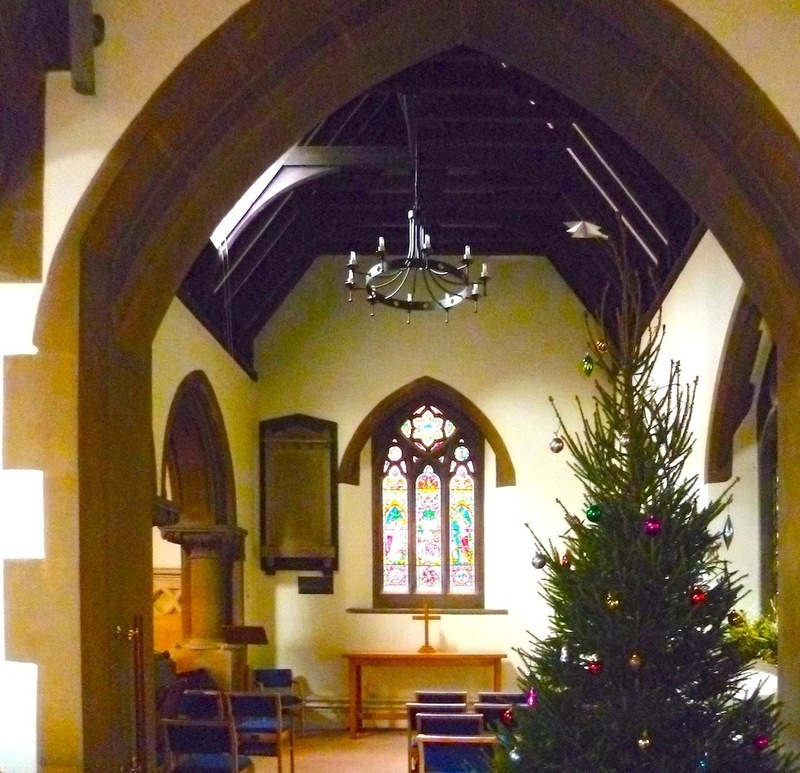 Interior of the church with Christmas wreaths on the columns. The church has many fine old monuments and brasses dating from long before the Victorian period, and commentaries usually focus on these. 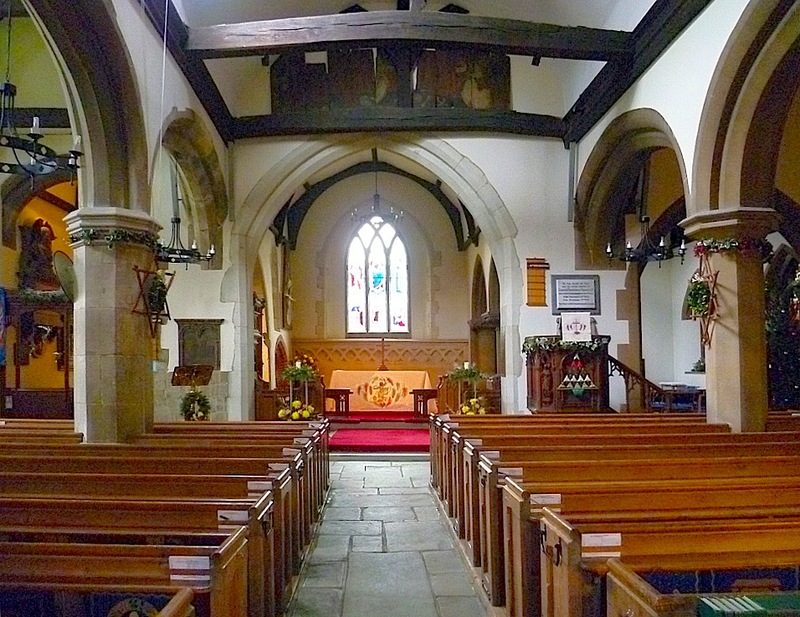 But the added south aisle makes all the difference to its atmosphere, lightening it considerably. 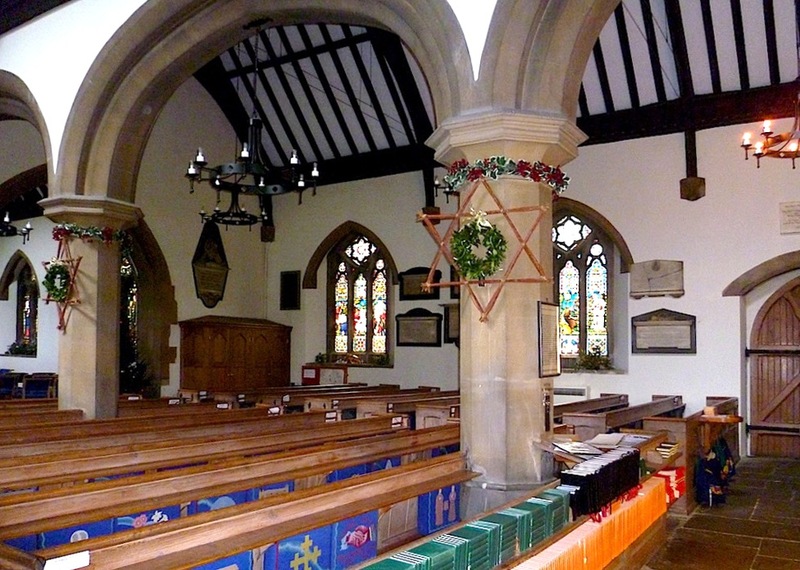 The carved oak pulpit to the right of the chancel, and the wooden pews, were also nineteenth-century additions. Looking across at the south aisle, towards the chapel. 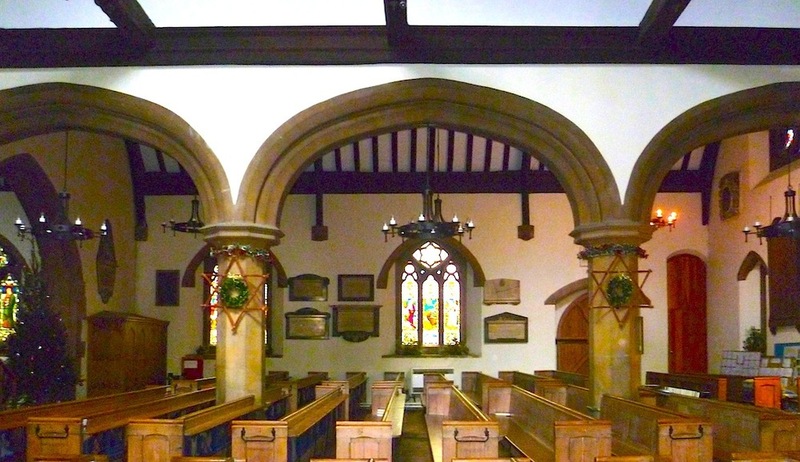 The octagonal columns seen above, with their simple moulded capitals, harmonise well with the piers to the north. Compare Ferrey's work here with his work at St Mary the Virgin Church, Merton Park, a similarly ancient church with Norman elements, where he added the north aisle just a couple of years later. Here at Thames Ditton, Edward Brayley says, "[t]he nave and north aisle form a long and wide area" (418), and it is true that these go down all the way into the tower area. But a good deal more width is added to the nave by the Victorian south aisle. Left: Another view of the south aisle. Right: The south or Lady Chapel. All the windows in the little chapel south of the chancel feature Maries – its east window, which dates from 1864 when the extension was completed, shows the three Maries at the sepulchre; the two side windows, which are slightly later, show St Mary and St John the Evangelist, and St John the Baptist with Mary Magdalene. They are all by Lavers, Barraud and Westlake. The eastern one is exceptionally pretty, though. 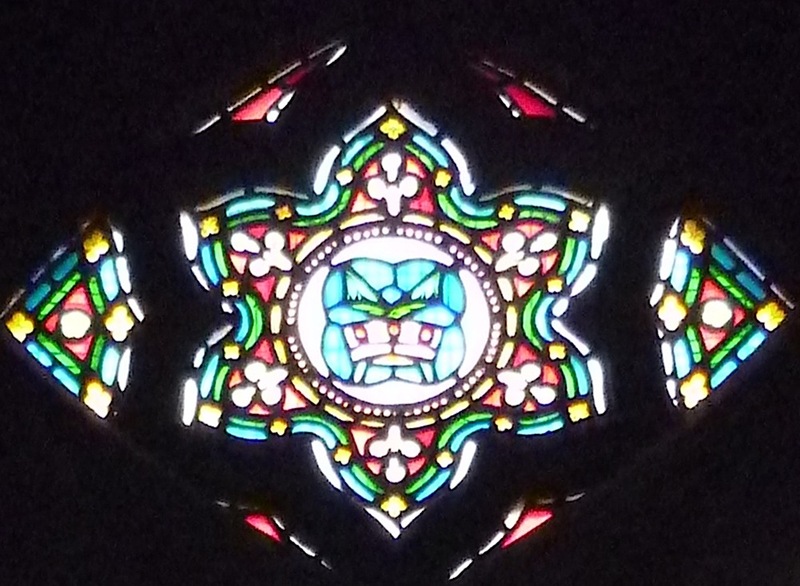 A picture of its main tracery light, with its colourful part-geometric, part-floral design, is shown below on the right. Brayley, Edward Wedlake. A Topographical History of Surrey. Ed. and rev. by Edward Walford. London, J. S. Virtue & Co. Internet Archive. Contributed by Allen County Public Library Genealogy Center. Web. 18 December 2014. "Church of St Nicholas, Thames Ditton." British Listed Buildings. Web. 18 December 2014. Eberhard, Robert. "Stained Glass Windows at St Nicholas, Thames Ditton, Surrey." Church Stained Glass Windows. Web. 18 December 2014. Nairn, Ian and Nikolaus Pevsner, rev. Bridget Cherry. The Buildings of England: Surrey. 2nd ed. London: Penguin, 1971. "Parishes: Thames Ditton." In A History of the County of Surrey: Volume 3. Ed. H E Malden. London, 1911: 462-67. British History Online. Web. 18 December 2014. 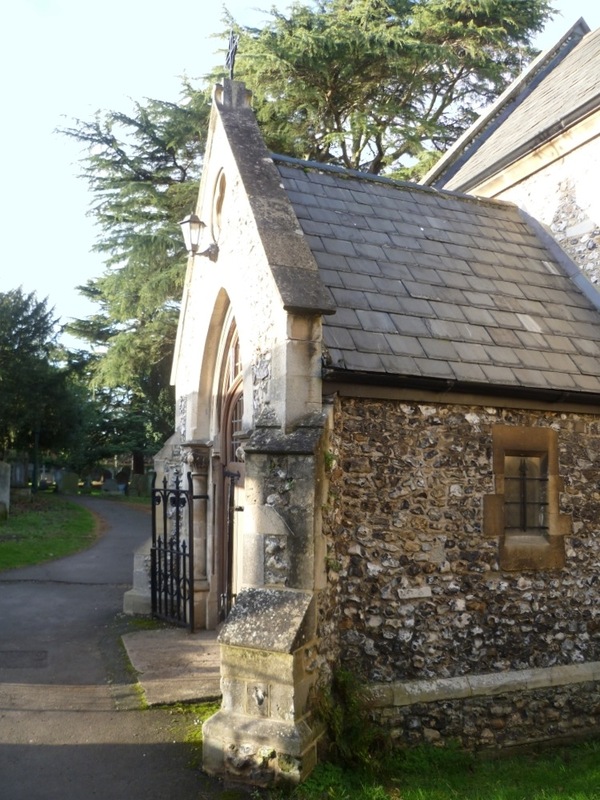 "Thames Ditton Conservation Area 1: St Nicholas Church and Environs." (Download the pdf from Elmbridge Council.) Web. 18 December 2014.